It would be great to find out that chocolate chips are healthy. These semi-sweet chocolate morsels are often used in baking, specifically chocolate chip cookies. 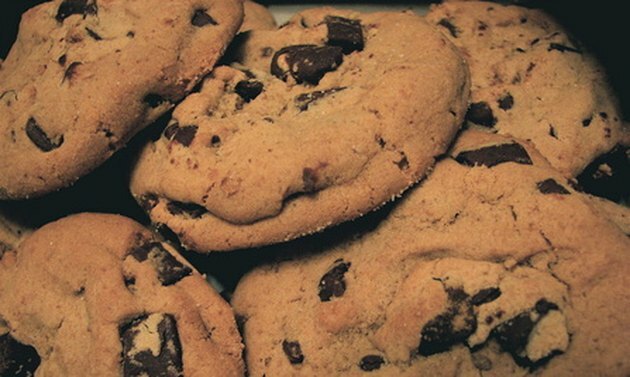 The cookie itself may not be as healthy as the chocolate, especially the dark chocolate called semi-sweet. You can eat them out of the bag, but you may want to watch your amounts. Chocolate chips are usually semi-sweet chocolate made from sugar, chocolate, cocoa butter, milkfat and soy lecithin, which acts as an emulsifier. They are also called semi-sweet morsels. The most prominent varieties are manufactured by Nestle, Hershey and Ghirardelli. Ingredients may vary slightly by brand. One tablespoon or 15 g of semi-sweet chocolate chips has 70 calories, 35 of which are from fat. This amounts to 4 g of total fat per tablespoon. Of that, 2.5 g are saturated fats. If you measure 1/4 cup of chocolate chips, you will have 280 calories and 16 g of total fat. Total carbohydrates weigh in at 10 g per tablespoon of chocolate chips. This includes 8 g of sugar. In a 1/4 cup of chips, you get 32 g of sugar. Dark chocolates such as semi-sweet chips are high in antioxidants. This is a welcome addition for this sweet morsel. According to the 2006, "Journal of Agricultural and Food Chemistry," natural cocoas have the highest levels of antioxidants followed by dark chocolates such as semi-sweet morsels and lastly milk chocolates and syrups. Antioxidants in chocolate have been found to increase high-density lipoprotein cholesterol levels -- the "good" cholesterol -- contributing to a better heart health profile, as reported in the November 2004, "Free Radical Biology and Medicine." The American Heart Association posted a news release dated August 17, 2010, that moderate consumption of high-quality chocolate reduces the risk of heart failure. Women who ate two to three servings per week had a 32 percent lower risk of developing heart failure.